Dr. Siegfried Schmidt, MD, PhD, is the clinical lead for the UF Health Precision Medicine Program CYP2D6 research protocol. A person’s CYP2D6 genotype has important relevance for response to codeine and tramadol and possibly other opioid pain medications that depend on the CYP2D6 protein for activation. Consequences of having a CYP2D6 genetic variant could include life-threatening central nervous system depression and death or, conversely, receiving no pain relief from codeine-containing medications. Starting April 6, 2015, the UF Health Pathology Laboratory at Rocky Point in collaboration with the UF Health Precision Medicine Program is pleased to offer CYP2D6 genetic testing. Approximately 5% to 10% of patients have a genotype leading to no CYP2D6 activity and are called Poor Metabolizers (PMs). PMs cannot metabolize codeine or tramadol into their more active forms (morphine or O-desmethyltramadol, respectively) and therefore have insufficient pain relief from codeine- or tramadol-containing analgesics. At the other end of the spectrum, another 5% of patients have too much CYP2D6 activity, and are called Ultrarapid Metabolizers (UMs). UMs quickly convert codeine or tramadol to their more active compounds, which can lead to toxic opioid levels with usual drug doses. Hydrocodone and oxycodone are also metabolized to more active forms by CYP2D6, but the impact of genetic variability on these agents is less clear. Additional drugs metabolized by the CYP2D6 pathway include SSRIs (e.g., paroxetine), SNRIs (e.g., venlafaxine), TCAs (e.g., nortriptyline), and other psychiatric medications (e.g., aripiprazole). Consultation with a clinical pharmacist is recommended if the results indicate an abnormal CYP2D6 genotype and you would like assistance with interpretation and/or therapeutic options. Also in collaboration with UF Health Family Medicine practices, we are conducting a 12-month proof-of-concept study to examine whether: 1) CYP2D6 genotyping will lead to better pain management and control; 2) having CYP2D6 genotype results is useful from the physician’s perspective to inform prescribing decisions for pain medication; and 3) genotype results beyond CYP2D6 would be informative for guiding use of other medications prescribed for patients in this setting. Patients will be recruited from two UF Health Family Medicine outpatient practices. One practice will serve as the implementation site, where patients who consent to participate in the study will undergo CYP2D6 genotyping. The other practice will serve as the control site. We will also employ novel continuing education methods in both sites that incorporate personal genotype evaluation for clinical practice faculty and staff to support our research on educating health care professionals about clinical applications of genomic medicine. 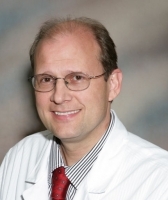 The clinical lead for the study is Siegfried O. Schmidt, M.D., Ph.D.